No, this is not an aerial photo. This was the view from my seat. It’s where you sit when you’re buying tickets for a group of 24. 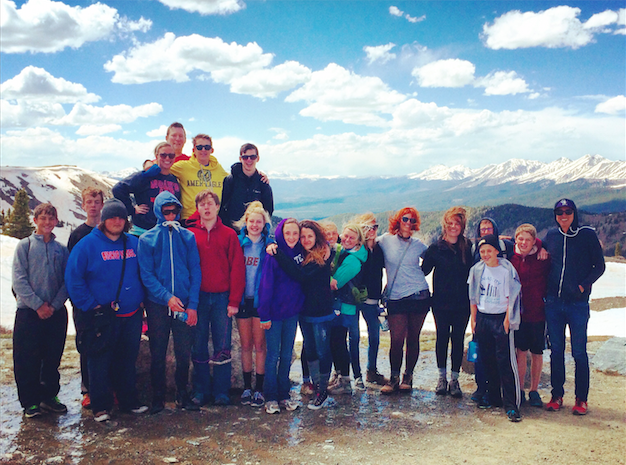 Every June, I lead my high school youth group on a trip to Colorado for a week. We call the trip “VERGE” and I always capitalize it and claim it’s an acronym, but it’s not – “verge” was just an awesome sounding word and it just looks more impressive when it’s in all caps. We spend the first three days in Denver, serving at various ministry sites all around the city serving kids, veterans, the homeless, day laborers, etc. We also spend some time every year boxing up donated goods at World Vision headquarters*. The goal of the first three days of VERGE is to notice God’s action in the city of Denver. Sometimes it’s in the face of a homeless man, or in the dedication of a ministry site leader. Other times it’s seen in our group members themselves. * – Something interesting/hilarious happened Monday at World Vision: we were boxing up “Broncos Super Bowl Champions” gear to ship off to Africa. If you remember, Peyton Manning malfunctioned and the Seahawks beat the Broncos 43-8 in the Super Bowl this past year. So all the Broncos pre-made champs gear gets shipped overseas. I tweeted a photo of it, and it went viral. If you Google “Broncos World Vision” you’ll now get page after page of articles about my tweet. As of this post: 818 retweets and counting. For the first time in my life, I experienced the true power of social media. After three days in Denver, we drive on to Buena Vista, CO, where we rock climb, whitewater raft, hike the continental divide and swim in hot springs. The location changes, but the purpose does not: we continue to look for where God is acting in the world around us. Often times it’s in the beauty of the mountains and he fact that we get to play in and on them. It comes in the form of a sunrise or a thunderstorm. It comes in the form of encouraging words to one another while we try to conquer the climbing wall. Each evening, we end our day doing two things: we take time to share where we saw God’s action around us that day. Then we take time to brag on how we saw God working through one another in the ministry sites in Denver and on the mountains and rivers in Buena Vista. We all adopt the perspective that God is at work all around us, and if we are intentional about looking for his action, we will undoubtedly recognize him throughout our day. We don’t bring God to either place – he’s working whether we show up or not – but what an honor that he invites us to participate in his action every day. 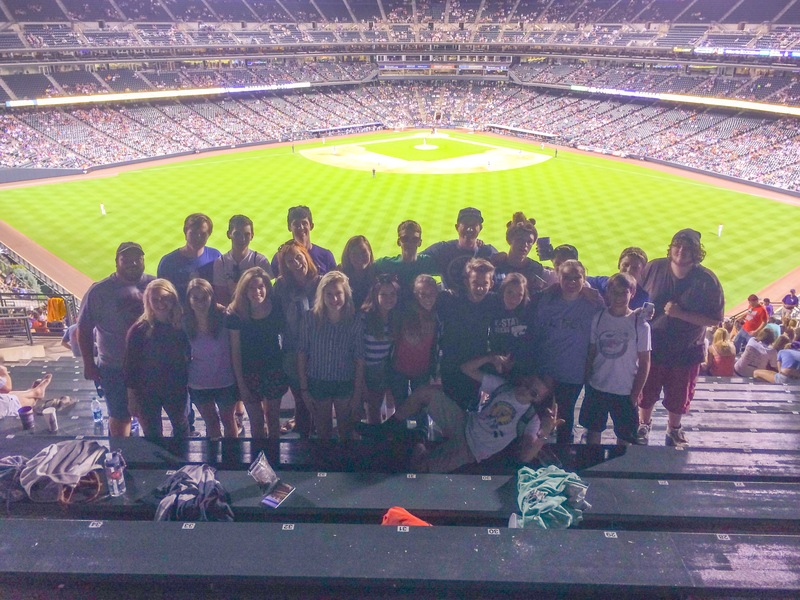 On Tuesday evening – Day 3 of our trip – we ended our day by talking in a Rockies game at Coors Field downtown. It was an awesome opportunity for me to synthesize VERGE with this ballpark tour and book project. Most of my students don’t care about baseball, and even the ones that do don’t really care about a game between the Rockies and Diamondbacks. But they all know about this project, and a few of them were really excited to be a part of it with me. One of my students in particular, Brennan, seemed pretty pumped to be coming along. Brennan is a brilliant dude. Full of life, energy, wisdom and leadership, he’s the type of student youth pastors love to have in the group because of his ability to unite a group. He has a cohesive personality that manages to draw a group closer together. He has this goofy selflessness about him that can draw attention not to himself, but to those around him. Long story short, Brennan’s an impressive guy. Perhaps his best quality, however, is his inquisitive spirit. He asks terrific questions about life, Scripture, and just general knowledge stuff. He is always striving to not only learn more about the subject, but to go deeper relationally with God and others. When we finally sat down in our seats, Brennan plopped down next to me and quickly started asking me great questions about the concept for this book. I told him the general points: I believe that everything is spiritual; the ballpark is heaven on earth for me; I see all sorts of connections between baseball and spirituality. I asked him to try to come up with some connections himself, and after some thinking, he responded with a brilliant thought as baseball related to our evening VERGE conversations over the previous couple of days. * – This is paraphrased, not verbatim. In retrospect, I really wish I’d been recording the conversation. And not only that, but the game is better for it. Have you ever been to a ballgame with something like 5,000 fans there? It’s depressing. There’s no buzz, there’s little cheering, and it certainly doesn’t feel lively. But the game plays on, whether there were fans there to participate in the action or not. Fans have the ability to fuel the ballgame. The energy builds and the players can feel it. I was just reading about Curtis Pride in Jonah Keri’s book, “Up, Up and Away” about the Montreal Expos. In his second career at-bat, Pride came in to pinch hit against the Phillies. The Expos were down 7-4, and with two men on base, he doubles to left-center field scoring both base runners to make it 7-6. It chases the Phillies starting pitcher from the game, and while the change is happening, the fans give Pride a 5 minute standing ovation. They just keep cheering and cheering and cheering, but Curtis Pride can’t hear it. Because Curtis Pride was 95% deaf. While the pitching change is still taking place, the third base coach comes over and tells him to tip his cap to the Montreal fans because they’re screaming like crazy. So he does. And they go even crazier. The Expos would go on to win 8-7. In the post game interview, Pride was asked if he could hear the cheering. He said no, but he could feel the vibration through the turf. If the ballpark was empty, that story doesn’t happen. Maybe he still hits the double, and maybe they still comeback to win anyway, but the cheering and the vibrations and the story just isn’t the same. The fans get to participate in the on field action. It was the same idea we’d been talking about: God is active in the world, and he is inviting us to grab a ticket to join him. And when we join in on the action, we create a buzz – more life – than there would be without our participation. The final value that I have for VERGE is based in community. Something amazing happens when a group serves and adventures together. Suddenly relational barriers that had previously existed don’t matter anymore. Labels are stripped away. Cliques begin to melt into one another. There’s no room for bad blood when people rally around a common goal. The jerk that cut you off on the I-70 headed to the ballpark is now the recipient of your high five in Section 435. The family member who annoys the crud out of you is now joining you in chants and cheers. The ballplayers themselves need each other too. We’ve all seen that Bugs Bunny cartoon where he’s playing all the positions at the same time, right? The pitcher, Bugs Bunny, winds up and throws to the catcher, Bugs Bunny. The ball gets creamed and Bugs runs out of the Polo Grounds and takes a taxi to the Statue of Liberty and catches the ball. Bugs is the entire offense too, hitting home run after home run. It’s funny because it’s impossible. Baseball needs a team. A catcher needs a pitcher. The pitcher needs a catcher. The fielders need a batter, and the batter needs a pitcher. Baseball cannot be an individual sport. You can’t have some freak athlete that plays all positions and takes over a game. In other sports, you can have a ball hog who does everything for the team. But in baseball, it isn’t physically possible. Even a pitcher who throws a perfect game needed the catcher and his fielders there to record the outs. Not only that, but baseball is unselfish. Bunting and sacrifice flys – batters give away an at bat to advance a runner for the betterment of the team. They’ll participate in a hit and run, relying on the other to do their part. They’ll take a seat in the 8th inning so a faster player can run for them. They’ll come in to pitch to one batter and then leave because they know that somebody else can get the next guy. Baseball isn’t about heroics. It’s about coming together and playing as a team. And after every team win, the players slap hands and congratulate each other. Baseball brings people – fans and players – together. 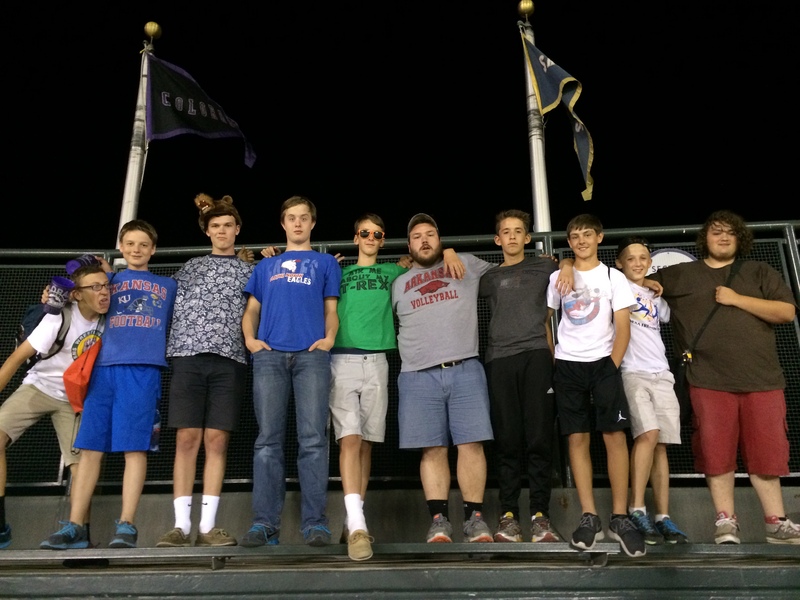 The game of baseball reinforces the same goals of VERGE: noticing and participating in God’s action, which ultimately brings us closer together. To be honest, I didn’t get to focus on the game very much. I wanted to hang with my students as much as possible. Plus, we were so far away from home plate it would take a second or so for the crack of the bat to travel all the way out to us. I’d look up to the action just in time to see the first baseman catch the ball from…I couldn’t tell where it had come from. The Rockies lost though, 4-2. Colorado had a great April and May, but they had lost 8 of their last 10 and 14 of their last 20. They went from being 22-14 and tied for 1st place in the NL West on May 8 to being an even 28-28 for our game on June 3. It was a 0-0 ballgame before Nick Evans and Chris Owings hit back-to-back solo homers off Jorge De La Rosa in the 4th. The D-Backs would add another in the 4th to make it 3-0. The Rockies’ DJ LaMahieu homered in the 5th off of D-Backs starter Chase Anderson. It was the only run Anderson allowed in 6 innings. After the Diamondbacks added another run in the 8th, the Rockies mounted a mini-comeback in the 9th. Troy Tulowitzki homered on a deep jack to left center, and Corey Dickerson singled to bring the tying run to the plate with nobody out. But Will Rosario flew out to CF and Charlie Culberson and LeMahieu both struck out to end the game. Buzzkill. Thirteen Down. Seventeen to go.